Volunteer - Wingspan Life Resources Wingspan Life Resources | Empowering Abilities. Nurturing Spirits. Caring for Life. Wingspan Life Resources strives to improve the lives of the people we serve by creating a meaningful life which allows them to stay engaged in the community and to realize their own unique gifts, talents and dreams. Volunteering is an opportunity to enhance the quality of life by helping people who are developmentally disabled to remain connected to the rest of the community, and helping them to develop new relationships. Drive an individual to church, a sporting event, an outing like fishing, or to educational programs. Meet someone in their home and work on a scrap-booking project or a puzzle. The possibilities are endless. We have several homes you would enjoy sprucing up and the people who live there would love it! Please help us improve the lives of the people we serve by providing a lovely yard and beautiful garden for them to enjoy. You would take great pride in seeing your hard work change the lives of the people we serve. homes. Projects may include painting, fix-it projects and cleaning garages. Assist in the planning and preparation of the annual Spring Gala. For more information about Wingspan’s Volunteer Program, please contact Darolyn Gray, Development Officer at dgray@wingspanlife.org or by calling 651-888-3112. 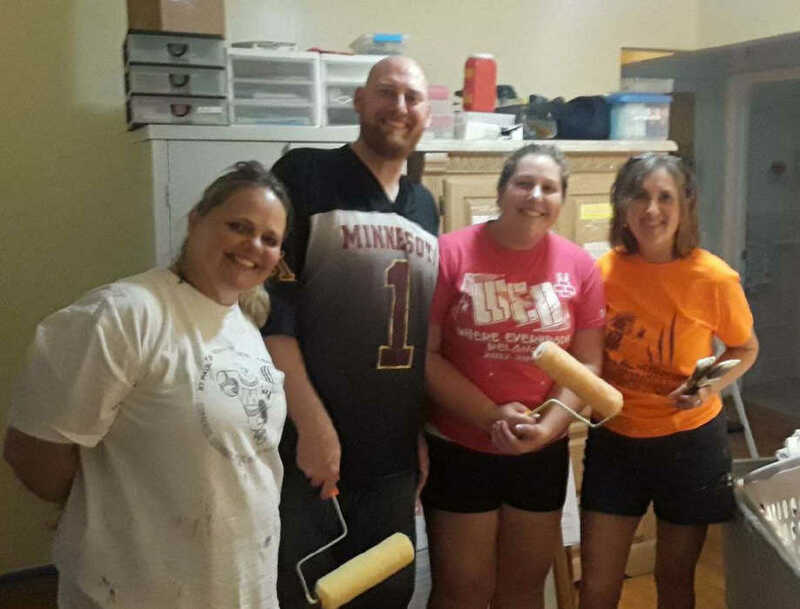 Four volunteers from Drake Bank did a fabulous job painting some interior walls as well as the porch at our group home on Troseth Road in Roseville. Thank you Annmarie Becker, Dan Batten, Melissa Hagood and Dani Schmaus! If your team or group would like to help with yard work or painting needs at any of our group homes throughout the Twin Cities, please contact Darolyn Gray, Development Officer at dgray@wingspanlife.org or by calling 651-888-3112. We also have opportunities to be a “buddy” to residents or help at special events.